"JCJNutrition's personalized meal plans are learning how to portion food, preparing delicious and healthy recipes, and the results from the weight loss." ​In my previous experience of trying to set up a personalized meal plan, I was not successful because I had trouble with food portioning. I reached out to JCJNutrition because I wanted professional help for meal planning and the prices for personalized meal plans are reasonable. The best thing about JCJNutrition's meal planning was the meals don't make you feel like you are on a traditional diet - where you eat very little and the food is very bland. The meals from JCJNutrition were delicious and easy to make at the same time. The benefits from purchasing JCJNutrition's personalized meal plans are learning how to portion food, prepare delicious and healthy recipes, and seeing the weight loss results. I would highly recommend JCJNutrition to anyone who is trying to change into a healthier lifestyle. "My focus now is on the quality of food that I eat. JCJNutrition really shared my goal to succeed." "Since working with JCJNutrition I have been able to lose those last few pounds that I could never seem to lose no matter how hard I worked out! I no longer worry about counting how many calories I consume in a day or feel bad about the occasional treat. When given my meal plan if it did not work with my personal schedule or digestive system, JCJ took the time to go through my meal plan with me to make the necessary changes. Through JCJ I have discovered that some of the discomforts I had thought were just a part of life are actually food sensitivities and intolerances." "The program was uncomplicated and the meal plans provided enough variation to keep me interested." "I asked JCJNutrition to help me lose weight since I've been struggling with my weight for most of my life. Since we don't live in the same city or province, we talked through e-mail about my eating and exercise habits and my goals. It was simple and within a week Jeannette gave me a meal plan that was personalized to my needs and goals. 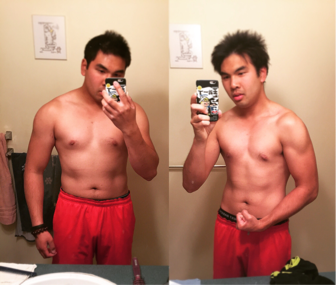 I started the meal plan at 188lbs and after three months I was down to 164lbs, losing an awesome 24lbs! Thanks again JCJ! " Gabriel, Calgary, AB "She developed meal plans to meet my goals, all while considering my personal preferences and travel. Jeannette even went the extra mile by suggesting menu items from the restaurants near the hotels where I stay during business travel." "I went to JCJ Nutrition with the goal of losing some weight and developing better eating habits. As a professional that travels frequently, it is easy to indulge at restaurants and not consider proper nutrition while on the road; hence despite maintaining an active lifestyle, my weight tended to fluctuate significantly. Jeannette took the time to ask detailed questions about my likes, dislikes, and current eating habits. She developed meal plans to meet my goals, all while considering my personal preferences and travel. Jeannette even went the extra mile by suggesting menu items from the restaurants near the hotels where I stay during business travel. As a result of the JCJ Nutrition program, I lost 5 pounds after the first week "Kick-start" and after two months on my program, I am well on my way to reaching my total weight loss goal. The 5-day meal plans also allow for enough flexibility to continue enjoying some of my favourite meals, but making better choices at the same time." Paul, Calgary, AB " Tell her what you crave and she has many healthy, tasty alternatives." "Working with Jeannette has been nothing shy of fun. Not only is her positive energy and attitude infectious, this girl knows what she is talking about with regards to leading a healthy lifestyle that does not deny your taste buds satisfaction. Tell her what you crave and she has many healthy, tasty alternatives."